Added on February 10, 2018 by bryce lankard. I seldom like the look of most RV interiors and this was no exception. I also knew there was some water damage to the flooring, so gutting and repairing was going to happen. Why not make it suit my tastes and needs while I was at it? 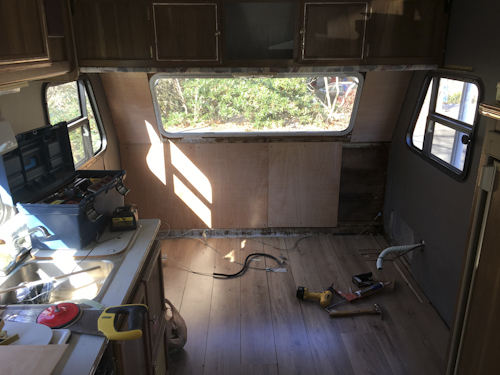 The underflooring needed to be replaced, the dinette and sleeper conversion was a bit of overkill for me. 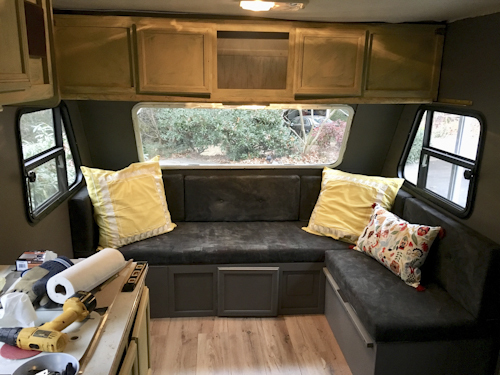 I am not a big fan of the fake wood cabinets and linoleum floors, and do I need to mention the upholstery??? 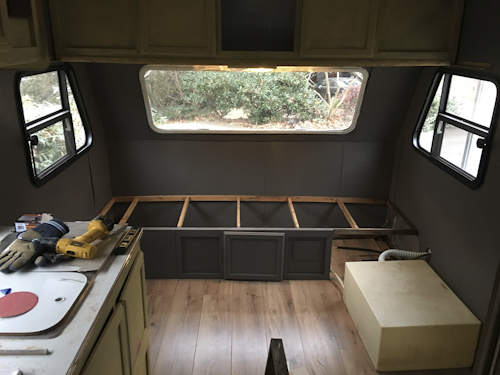 So I redesigned the dinette area to have a more permanent and comfortable desk/dining table, planned to put in wood flooring, paint the cabinets and die the upholstery. 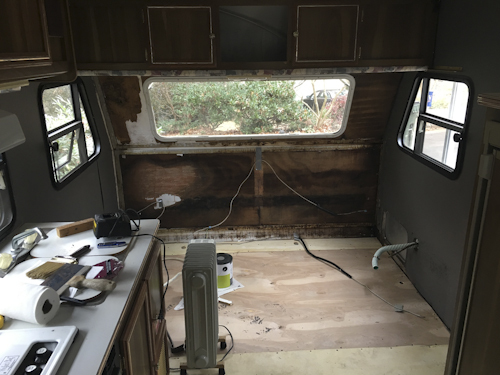 This involved removing every single bit of the dinette, the wiring, plumbing, water tank so I could first to do the underfloor. I discovered more damage to the front wall as well after all that was removed. Here is a sequence of the work that took place over three weeks during one of the worst winter storms in North Carolina history. Some of the details that made me happy: I opened up a space in the overhead bunk (I wouldn't even have trusted a small child sleeping up there!) to expose a small bookcase, and the rest of the space holds camera gear and office stuff. It can be opened to get full access to everything. I added unique handmade mexican ceramic knobs to all the cabinets. 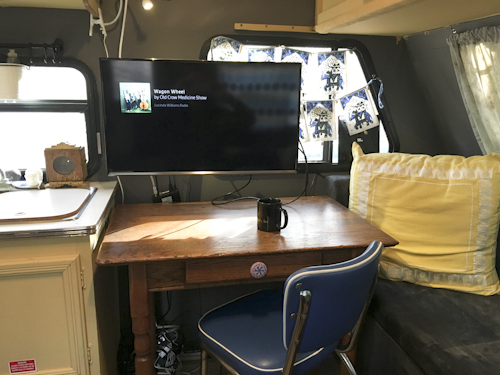 I found a great vintage wooden table that fit perfectly in the space I opened up by eliminating one side of the dinette. I added a vintage diner chair that I already had, and is very comfy. I was gifted some cool pillows by Lori Vrba and some stained glass that Brad Johnson had left at his old house in Efland. One of the most useful changes was adding an armature for the TV/Computer monitor. It floats over the table so that I can easily pull the table out for dinners. It is articulated and enables me to adjust it to see from the desk, the couch or the bed! I had a few leaks after putting everything back together, but I was able to solve that fairly well. If I were to do anything differently, it would be the floor. I was concerned when I saw how thin the original subfloor was. 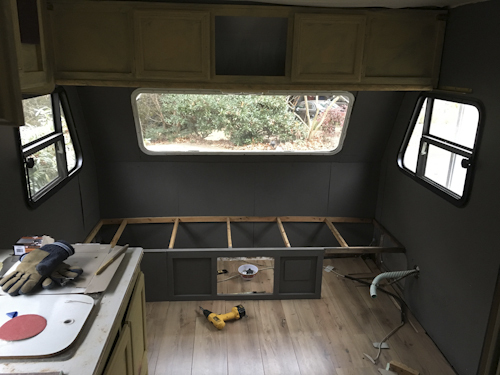 My fear was that if I went thicker with that and then put the wood laminate on top, I wouldn't be able to open some cabinets. Even after adding some additional supports, I still find the floor to be a bit squishy. This sometimes causes the laminate floor to separate. 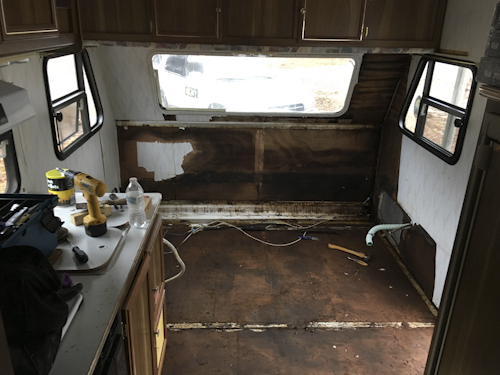 If I am motivated this spring, I might rip all that out and put in some stronger plywood with a nice finish on it and stain and polyurethane that instead. Added on January 24, 2018 by bryce lankard. Southern Culture on the Skids is one of my all-time favorite bands. I had the good fortune to be in an art class with Rick way back in the day and my clodhopper self has found great joy in their entire musical output. I even got to be on stage performing on "Viva de los Santos" in a stinky wrestling mask one time in New Orleans. This particular song, "My House has Wheels" has been uniquely inspirational over the years, never more than right now. Check out their video and I encourage you to sing along. Wanna know the lyrics...OK, here they are. Added on January 19, 2018 by bryce lankard. It is with a heavy heart that I am starting this blog. 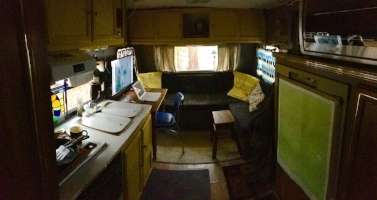 In November of 2017, the capricious wheel of fate presented me with some motivation to follow a long-held fantasy of mine... to live full time in an RV. 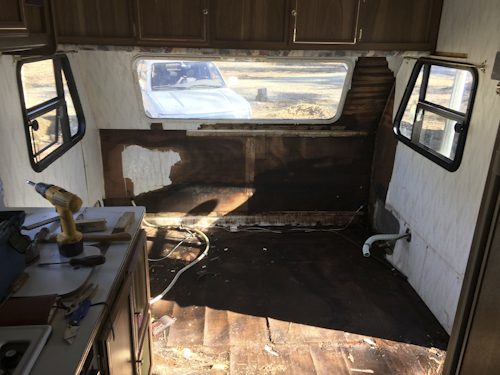 I prepared to move my studio into a workshop in Durham, NC and began hunting for an older RV to restore and customize. I shared this idea with my parents over thanksgiving and they supported this notion, especially my dad, who loves a great adventure. 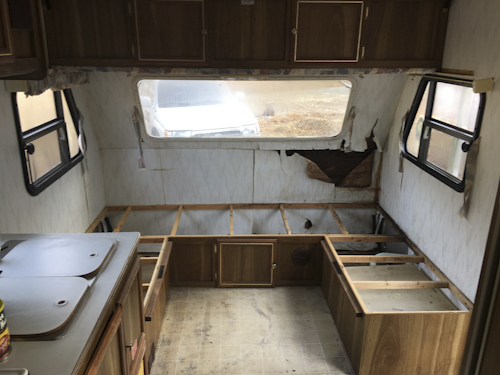 I found and purchased my project, an 18 foot 1997 Rockwood trailer and began the painstaking but fun process of molding it into a tiny house on wheels that would suit my tastes and needs. Work was slow and I had the time over the holidays to work on it every day. As I neared the date I intended to launch this vessel, we in NC got hit by the epic snow cyclone Greyson. and I had to delay my start date. Then on January 6th I got the news, my father had passed away very unexpectedly. I have never been more utterly devastated in my life. 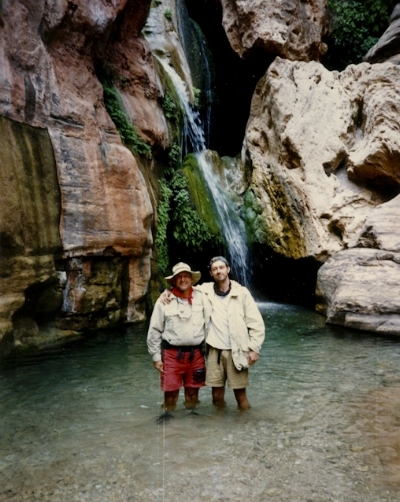 My father was one of the most vibrant and vital people you could ever hope to meet and for those who had the good fortune to have done so, he was undeniably one of the most special humans walking the earth. He was my champion, my cheerleader, my mentor and my hero. This adventure I was about to embark upon would delight him to no end. And he was gone. As I move forward, I am still at the stage where I find myself thinking him at almost every hour of the day and I find it difficult to continue. 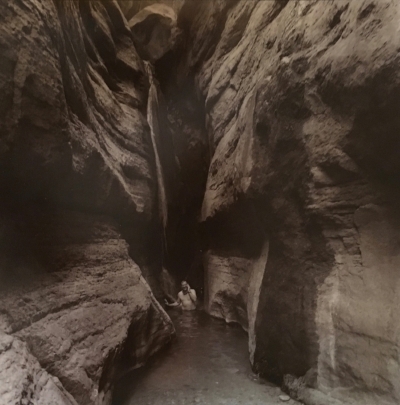 But I had already envisioned this project as something of a vision quest, a spiritual journey of a sort, and now I have a new imperative to take full advantage of this opportunity, to grasp at every offering it provides, to be committed and to endure, because I now know I must, I absolutely must, carry his spirit with me. I have added a tiny shrine to him inside that holds a small amount of his ashes, so he will literally be with me as I travel this path. I dedicate this quest to him. I love you dad.